First, see Ambrotype. The tintype, also known as a ferrotype, is a variation on this, but produced on metallic sheet (not, actually, tin) instead of glass. The plate was coated with collodion and sensitized just before use, as in the wet plate process. It was introduced by Adolphe Alexandre Martin in 1853**, and became instantly popular, particularly in the United States, though it was also widely used by street photographers in Great Britain. the process was simple enough to enable one to set up business without much capital. It was much faster than other processes of the time: first, the base did not need drying, and secondly, no negative was needed, so it was a one-stage process. Cheap to produce, a typical price for a tintype was 6d (2 1/2p) and 1 shilling (5p). being more robust than ambrotypes it could be carried about, sent in the post, or mounted in an album. The material could easily be cut up and therefore fitted into lockets, brooches, etc. The most common size was about the same as the carte-de-visite, 2 1/4'' x 3 1/2'', but both larger and smaller ferrotypes were made. The smallest were "Little Gem" tintypes, about the size of a postage-stamp, made simultaneously on a single plate in a camera with 12 or 16 lenses. Compared with other processes the tintype tones seem uninteresting. They were often made by unskilled photographers, and their quality was very variable. They do have some significance, however, in that they made photography available to working classes, not just to the more well-to-do. Whereas up till then the taking of a portrait had been more of a special "event" from the introduction of tintypes, we see more relaxed, spontaneous poses. Some tintypes that remain are somewhat poignant. 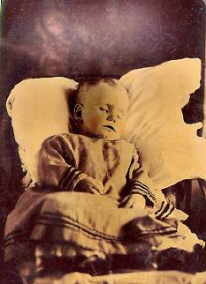 The one shown here is of a child who has died. If this seems bizarre, it would seem to have been quite a practice in the last century. In fact, the original name for Tintype was "Melainotype." It is perhaps worth adding that there was no tin in them. Some have suggested that the name after the tin shears used to separate the images from the whole plate, others that it was just a way of saying "cheap metal" (ie non-silver). Being quite rugged, tintypes could be sent by post, and many astute tintypists did quite a trade in America during the Civil War, visiting the encampments. Later, some even had their shop on river-boats. Tintypes were eventually superseded by gelatin emulsion dry plates in the 1880s, though street photographers in various parts of the world continued with this process until the 1950s; the writer well remembers being photographed by one of these street photographers in Argentina, when he was a boy. Eventually, of course, 35mm and Polaroid photography were to replace these entirely. ** Professor Hamilton L. Smith was the first to make ferrotypes in the Unites States, and he and Victor Moreau Griswold introduced the process to the photographic industry. *** Sometimes failure to recognise this has led to false assumptions. One reader kindly drew my attention to an article in the Guardian, regarding Billy the Kid, whose picture is shown on the right. (See HERE). He was not, as has been assumed by many, left-handed.